After the end of the Hellfire Club Archaeological Project Week Two, we are beginning to understand a bit more of the nature of the archaeology. In our first trench we’ve uncovered the remains of the stone cairn that once formed the main mound of the tomb, along with clay material that may once have been sods of turf that also formed part of the mound. Within this clay we’ve found more flint from people making stone tools over 5,000 years ago, along with charcoal and some tiny fragments of burnt bone so it is a very promising layer that should provide material that we can radiocarbon date. We have also started to open our second trench, which again reveals more of the story of the demolition of the tomb when the Hellfire Club was built. We had lots of visitors this week who generously shared their stories and interest in the site, including Tallaght Community School who came to visit and helped us to get started on the second trench. There’s some natural archaeologists there! Many people who visit have lots of questions. One of the questions we get asked quite often by visitors to the Hellfire Club Archaeological Project is ‘how do you know where to dig?’ and that’s a really good question! How did we know where to dig when we started the Hellfire Club Archaeological Project? In archaeology, we use a number of techniques to help us plan where to start our excavations, from research to topographical and geophysical survey. It was already known that there were megalithic tombs on the site. One of the earliest accounts of the tombs comes from Austin Cooper who visited the site in 1779 (some 54 years after the Hellfire Club was constructed, I’ll feature more of the early accounts of the tombs and the Hellfire Club in a future post). They are also recorded by the National Monuments Service as monuments DU025–001001 (the larger tomb) and DU025–001002 (the smaller tomb), and designated as passage tombs. One of the simplest ways that we evaluate a site is by visiting the site for a visual inspection. 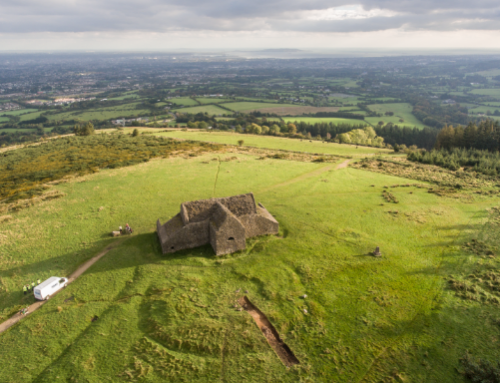 On the ground, the larger of the tombs was clearly visible as the roughly circular bank at the rear of the building, and in our drone images of the Hellfire Club it stands out far more clearly than it does from the ground. From the air you really get a sense of the size of the monument, and that it is even larger than the Hellfire Club itself! Dr. Stephen Davis (UCD) helped us to understand the topography of the site by using LiDAR. LiDAR, (which stands for Light Detection and Ranging), is a method of remote sensing that uses light to measure varying distances to the Earth. This light is in the form of a laser pulse, and these pulses can be used to produce exact data about the characteristics of the surface of the ground, and can produce great insights into the topography, highlighting potential archaeological features that may not be visible to the eye. LiDAR instruments are made up mainly of a laser, a special GPS receiver, and a scanner typically attached to an airplane or helicopter for use over a wide area. 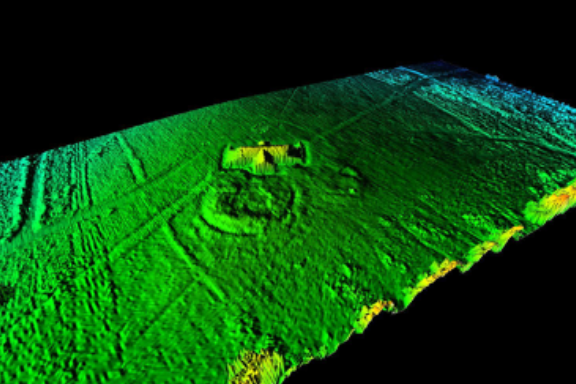 In this LiDAR image you can clearly see the larger of the two tombs as a raised circular feature directly behind the Hellfire Club, and the smaller to the east. You can also make out landscape features like a large linear feature (a possible road or bridleway) that runs roughly east – west intersected by the Hellfire Club, and a number of linear features running north – south that may represent old forest plantation lines. In 2014 we worked with Earthsound Geophysics to carry out a survey with high resolution Magnetometry, Electromagnetic Induction and Earth Resistance Surveys. All of these different techniques allowed us to gain a better sense of what lies beneath the surface. The survey of the larger tomb, listed as DU025-001001, suggested it is possible that it is a large passage-tomb, with the remains of a cairn still partially intact. 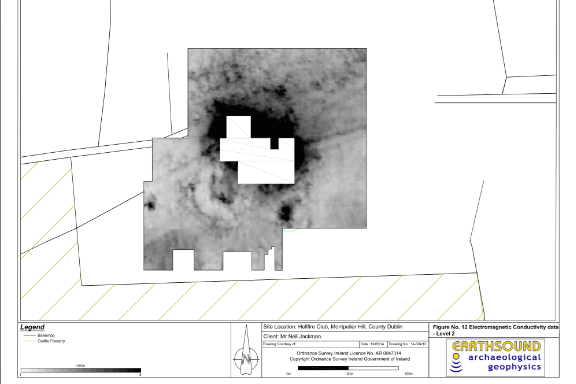 The geophysics again shows that the cairn is open towards the north, and this may reflect disturbance from it being quarried for construction material for the Hellfire Club. Dr James Bonsall of Earthsound Geophysics and Christine Melia carrying out the geophysical survey to identify archaeological features beneath the surface. So as you can see, choosing where to dig in archaeology can involve a number of different techniques, with each one adding a little more of the picture. However sometimes it isn’t until you actually start the excavation that you get a true sense of the site. That is even more true in a case like this one, where the tomb has been so badly damaged during the construction of the Hellfire Club. Still, our excavation so far has revealed that at least a portion of the cairn still survives, we hope that we get a better understanding of its construction over the next week. All of this project has been made possible by the funding and support provided by South Dublin County Council’s Heritage Officer Rosaleen Dwyer, Coillte and the Dublin Mountains Partnerhsip. Commendable that project is being shared with so many.Over the years we thought it was all about Speaker Connolly and Co.! Wonderful … Way to go. Are there opportunities for teaching on the site, being close to a high unemployment area it seems to me it would be a place for such an enterprose . very interesting I will be following this , I lived in Crumlin till I left for Canada in 74 I always looked up at Hellfire and knew in my heart there was more to the story. Good luck to you all , now go find our past . Fascinating, I can see the Hellfire from my house in Terenure, Must try to get up and see for myself.